I jump back to home page and my shopping cart show up empty when I click "Proceed to Checkout" ? 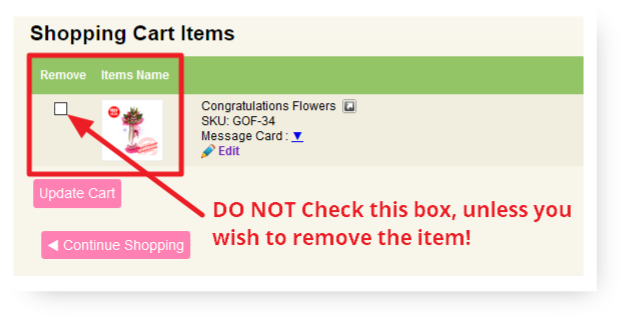 Please DO NOT check the "Remove" box when you proceed to checkout, unless you wish to remove the item. Do I need to register as a member to purchase items form your online store? How do I place an order offline ? Call us at 03-5635 2133 during office hours. You may either refer to our website or inform us your requirements and we will advise you on the most suitable bouquets for the occasions. Upon received your order, we will call for confirmation and advise on payment. How do I make payment and what are the payment options available? while making M2U fund transfer. We are willing to collect your payment (upon request only) for free if the location is within our FREE Delivery Zone With the minimum payment of RM200.00 per collection. How secure is "MOLPay" payment gateway? All communication between you and MOLPay are encryted unsing 256-bit SSL connection. MOLPay services are scanned and certified by Hacker Safe & SiteLock everyday. MOLPay services comply with the global data security standard - Payment Card Industry: Data Security Standard (PCI-DSS). To protect both cardholder and merchant, MOLPay has implemented 3D-Secure environment (Verified by VISA & MasterCard SecureCode) for its credit card payment processing. Besides, MOLPay does not store any cardholder's sensitive data and information. What are the free delivery zones available? What are the delivery charges for areas other than those listed in the free delivery zone? All prices shown and all transactions are in Ringgit Malaysia (MYR). You will receive a email notification that we have your order.